Landscaping enthusiasts have many options for achieving colorful yards in autumn. Yet perhaps nothing else in eastern North America is as intimately associated with the fall foliage season as are the different types of maple trees. Although, for all trees, fall foliage color varies based on many factors, like precipitation, temperatures, and more throughout the year at your location. Take a look at some of the best varieties when thinking about landscaping ideas for fall colors in your yard. The fall foliage of red maples (Acer rubrum spp.) unfortunately sometimes makes a liar out of the trees' common name. The dirty little secret is that the color of its autumn leaves is sometimes yellow, depending on conditions (even its alternate common name, "swamp maple" is something of a misnomer because its wild habitat is not restricted to swampy areas). It is best to stick with cultivars known for their fall color consistency, such as Autumn Blaze. If you want red fall foliage, try purchasing Acer rubrum Red Sunset, a tree that will reach about 50 feet in height, with a spread of a little less than that. This red maple tree grows best in zones 4 though 9 in full sun to partial shade, where the soil pH is acidic and the ground provides good drainage. It does, however, tolerate clay soil. Even relatively consistent cultivars such as Red Sunset maple trees, however, are at the mercy of the weather. The intensity of fall foliage color can be lessened due to extreme summer heat and drought. And you are not out of the woods once fall arrives. Optimal fall foliage is dependent upon sunny days and crisp nights at the beginning of the autumn season. Sugar maple trees (Acer saccharum) should be grown in zones 3 to 8, in an area of your yard that is well-drained and gets full to partial sun. Famous as the source of maple syrup, sugar maple trees can reach 80 feet or more in height, with a spread of up to 60 feet. 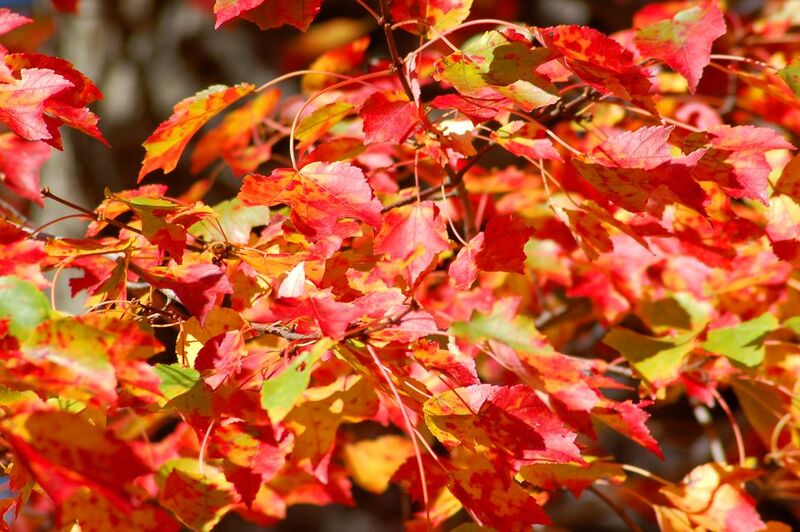 Sugar maples have a fall foliage color range from yellow to orange to red. Norway maple trees (Acer platanoides) adapt well to many soil types and environmental conditions. In fact, they adapt too well, as they have become an invasive plant in North America. For this reason, you might want to substitute that Norway maple with sugar maple trees or red maple trees, which boast superior beauty anyway. A reason for the widespread use of Norway maples as shade trees in urban areas across the U.S. is that they tolerate pollution better than many trees. Fall foliage color is yellow and it reaches an approximate size of 50 feet high and 50 feet wide. Norway maples do best in full sun and well-drained soil. Silver maple (Acer saccharinum) is another tree that is not recommended. It too has yellow fall foliage, but it is an altogether unappealing pale shade of yellow. On top of that, this type has weak limbs that are prone to storm damage. Two of its few good points are that it is a fast-growing shade tree and tolerates wet soil. Grow it in full sun in growing zones 3 to 9. Amur maple trees (Acer ginnala Flame) are grown in zones 2 through 8 and are a compact alternative to the specimens described above, attaining a maximum size of only about 20 feet by 20 feet. Like Norway maple trees, however, they are considered invasive. Although they can tolerate light shade, Amur maple trees achieve their best fall color if you make an effort to ensure they get full sun. The effort will pay off handsomely; their fall foliage color is a brilliant red. Also from Asia originally and also bearing red fall foliage is the paperbark maple (Acer griseum). Most authorities, however, do not list it as invasive. Its common name alludes to the fact that its peeling bark is considered ornamental like the bark on some types of birch trees. Striped maple (Acer pensylvanicum) is native to the northeastern U.S. and southeastern Canada. It is also called moosewood, because moose eat it, as do deer, rabbits, porcupines, and beavers. This is a good native choice if you are seeking a small tree for fall foliage color since it attains a maximum height of just 30 feet. It can easily be kept shorter than that by pruning; you can grow it as a shrub if you wish. Its leaves turn a nice yellow in fall. The primary common name, striped maple refers to the white stripes that run vertically up the green bark of the trunk of the tree when it is young. This is an understory tree in the wild and needs to be planted in a shady spot in the landscape. For soil, a sandy loam is best, since it requires good drainage. One type of maple has a highly specialized use in the landscape, the hedge maple (Acer campestre), which, as its common name suggests, is used in tall hedges. Hedge maples are valued not so much for their fall foliage as for their growth habit and the fact that they are tolerant of compacted soil and pollution. In terms of growth habit, their branching pattern is dense and begins far down on the trunk. Also, they are slow-growers. Put all these facts together, and it is easy to see how Acer campestre with a little judicious pruning (they can reach a height of 35 feet if left unchecked) could be an ideal choice where a tall hedge is wanted to screen a property along a roadside.